The BlackTrax CHOP will provide motion tracking data from BlackTrax Motion Tracking Systems is a vision-based real-time tracking system developed by CAST Software that specializes in large-scale performances. BlackTrax Beacons ("BTBeacons") are attached to performers or rigid objects, and the BlackTrax system accurately tracks the Beacon's position, rotation, velocity, and acceleration. The BlackTrax CHOP will accept tracking data from BlackTrax Motion Tracking Systems. See BlackTrax. The BlackTrax CHOP works in conjunction with the BlackTrax system. BlackTrax tracks up to 85 BlackTrax Beacons and sends data regarding their position, rotation, velocity, and acceleration to TouchDesigner inside RTTrPM Packets. Each Beacon can have up to 3 LEDs attached, which can also be independently tracked in TouchDesigner. 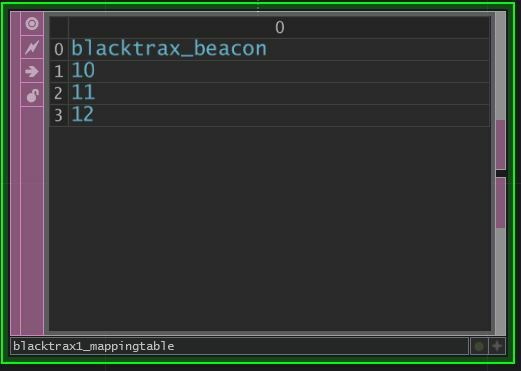 Each Beacon will have an ID that is specified in BlackTrax software and that Beacon ID must be mapped correctly to CHOP channels in TouchDesigner using the Mapping Table. Alternatively if the IDs are incremental then the "From Max Beacons" option in "Output Format" can be used. The server software should be set to send data in the WYSIWYG coordinate system (which should be the default). Rotations should be sent in Euler angles, not Quaternions. TouchDesigner should support both endian settings, but it's best to leave those as their default values. Active active - While on, the CHOP receives information sent to the network port. While Off, no updating occurs. Port port - The port that will accept packets. Protocol protocol - ⊞ - The network protocol to use. Refer to the Network Protocols article for more information. Network Address netaddress - When using Multicast, this is the address that will listen for packets. Sample Rate samplerate - Sets the sample rate of this CHOP. Output Format outputformat - ⊞ - Specifies the format for the CHOP channels (ie. how many beacons to add). "From Mapping Table" adds one beacon to the CHOP for every row in the mapping table. "From Max Beacons" adds the number specified in the "Max Beacons" parameter. Max Beacons maxbeacons - Specifies how many beacons to add to the CHOP. Used with the "From Max Beacons" output format. Centroid centroid - When enabled, adds beacon translation and rotation channels. Velocity velocity - When enabled, adds beacon velocity channels. Acceleration acceleration - When enabled, adds beacon acceleration channels. LEDs leds - When enabled, adds position channels for each LED in the beacon. Reset Channels reset - Clears any stored beacons and removes any stale data. Mapping Table mappingtable - A DAT table that maps beacon IDs to CHOP channels (beacon0, beacon1, etc.). The first row will map to beacon0, second row to beacon1, etc. Beacon ID is a unique non-negative integer and is specified within BlackTrax applications. Below is an example of a mapping table that is tracking 3 beacons with IDs 10, 11, and 12. In this example 10 is mapped to beacon0, 11 is mapped to beacon1, and 12 is mapped to beacon2. This page was last edited on 24 January 2019, at 18:43.